Cell-mediated immune responses to glycoantigens have been largely uncharacterized. Protective T cell responses to the pathogenic yeast Cryptococcus neoformans are dependent on heavily mannosylated Ags termed mannoproteins. In the work presented, the innate immune response to mannoprotein was determined. Purified murine splenic dendritic cells (DC), B cells, and macrophages were used to stimulate mannoprotein-specific T cells. Only DC were capable of any measurable stimulation. Depletion of DC resulted in the abrogation of the T cell response. Human and murine DC rapidly captured fluorescent-labeled mannoprotein by a mannose receptor-mediated process. Using transfected cell lines, the type II C-type lectin receptor DC-specific ICAM-3-grabbing nonintegrin (CD209) was determined to have affinity for mannoprotein. Taken together with prior work demonstrating that mannoprotein was captured by the macrophage mannose receptor (CD206), these data suggest that multiple mannose receptors on DC recognize mannoprotein. Pulsing experiments demonstrated that DC captured sufficient mannoprotein over 2 h to account for 50% of total stimulation. Capture appeared dependent on mannose receptors, as competitive mannosylated inhibitors and calcium chelators each interfered with T cell stimulation. By confocal microscopy, intracellular mannoprotein trafficked to an endo-lysosomal compartment in DC, and at later time points extended into tubules in a similar fashion to the degradation marker DQ-OVA. Mannoprotein colocalized intracellularly with CD206 and CD209. These data suggest that DC provide the crucial link between innate and adaptive immune responses to C. neoformans via a process that is dependent upon the efficient uptake of mannoprotein by mannose receptors. Glycoproteins have long been known to influence T cell immune responses to a wide variety of Ags such as the oncogenic proteins, mucin 1 (1) and prostate-specific Ag (1, 2, 3). Yet, the exact immunologic mechanism has not been well described. Investigations into a class of pattern-recognition receptors have begun to shed light into the biological significance of carbohydrate recognition by immune cells. Carbohydrate-binding receptors (CBR)4 are part of the larger pattern-recognition receptor family and are expressed on a wide variety of cell types. CBR participate in the recognition of a wide variety of microbes and microbial-derived products as well as endogenous tissue ligands (4, 5, 6, 7, 8). Although over 15 CBR have been described to date, two of the most physiologically studied receptors are the macrophage mannose receptor (MMR) and dendritic cell (DC)-specific ICAM-3-grabbing nonintegrin (DC-SIGN). Similar to other members in their class, MMR and DC-SIGN exist as single transmembrane chains and require Ca2+ for their carbohydrate-binding properties, and thus are termed C-type lectins (9, 10, 11). CBR affinity for sugars is diverse, but the most common monosaccharide recognized is mannose (reviewed in Refs.10, 12). Furthermore, it has become clear that tertiary and quaternary structure of complex carbohydrate chains can be specifically differentiated by CBR (13). Although described on many cell types, the predominant cells expressing C-type lectin receptors are APC. Among APC, DC appear to express the greatest diversity of receptors including MMR, DC-SIGN (9, 14), Langerin (CD207) (15), and BDCA-2 (16). Motifs identified on the intracellular domains of C-type lectins allow the delivery of captured cargo to MHC class II-containing vesicles (17), followed by recycling to the plasma membrane for successive rounds of Ag capture (18, 19, 20, 21, 22, 23). Although these studies begin to dissect the surface receptors required for glycoprotein recognition, most work performed has used artificial and/or recombinant molecules, and it is unclear whether native glycoantigens will show similar biological effects. Moreover, the cell types required for immune enhancement by glycoproteins have yet to be determined. All APC have been described to express lectin receptors including DC, macrophages, and B cells and may potentially contribute to glycoprotein-specific T cell immunity. In the studies presented, we used native glycoantigens derived from the pathogenic yeast Cryptococcus neoformans. C. neoformans is a significant cause of disease in persons with T cell dysfunction, including AIDS, lymphoma, and those receiving immunosuppressive medication (24, 25). The morbidity and mortality of cryptococcosis remain high despite advances in therapy, spurring efforts directed toward the identification of immunoprotective cryptococcal Ags that could serve as vaccine candidates (26). In vivo and in vitro studies have identified mannoproteins (MP) as the major T cell antigenic determinants from C. neoformans (27, 28). MP are a group of glycoproteins with heavy carbohydrate decorations terminating in mannose residues (29, 30, 31, 32, 33). Although their apparent molecular sizes are heterogeneous, sequence analysis shows a conserved serine/threonine-rich domain at the C terminus of MP, which serves as potential donor sites for extensive O-linked carbohydrate modification (30, 31). Although fungal and mammalian cells both attach glycans to proteins via N-linked and O-linked glycosylation, important differences exist in the choice of sugars. The most common carbohydrate used for glycan synthesis by fungi are mannose or mannose-galactose combinations. In contrast, mature mammalian glycoproteins rarely contain mannose (34). Thus, exposed mannose residues on fungal glycoproteins are potential sites of interaction with the host innate immune system. Indeed, MP-specific T cell responses are highly dependent upon the presence of C-type lectins (28, 31, 32). In the present study, we characterized the host cell type and receptors responsible for recognition of MP and examined the cellular events following immune recognition. All cell culture and chemical reagents were obtained endotoxin-free from Invitrogen Life Technologies and Sigma-Aldrich, respectively, unless otherwise stated. Except as indicated, cells were maintained in RPMI 1640 with the following additives: 10% FBS, 2 mM l-glutamine, 100 U/ml penicillin, and 100 μg/ml streptomycin (complete medium). Fetal skin DC (FSDC) (35), a gift from Dr. P. Ricciardi-Castagnoli (Milan, Italy), was maintained in IMDM with 5% FBS, l-glutamine, penicillin/streptomycin, and 2-ME. The MP-reactive T cell hybridoma cell line P1D6 (31, 32) was maintained in RPMI 1640, 10% FBS, l-glutamine, 40 U/ml penicillin, 40 μg/ml streptomycin, 55 μM 2-ME, 10 μg/ml ciprofloxacin, 0.25 μg/ml amphotericin B, and 1% hypoxanthine/thymidine. CTLL-2 cells (TIB 214; American Type Culture Collection (ATCC)) were maintained in RPMI 1640, 10% FBS, l-glutamine, 40 U/ml penicillin, 40 μg/ml streptomycin, 55 μM 2-ME, 10 μg/ml ciprofloxacin, 0.25 μg/ml amphotericin B, and 10 U/ml recombinant human IL-2. K562 cell lines were maintained in RPMI 1640, 10% FBS, l-glutamine, 10 μg/ml gentamicin, and 10 mM HEPES. JAWSII (CRL-11904; ATCC) cells were maintained in anti-MEM supplemented with 20% FBS, 4 mM l-glutamine, sodium pyruvate, and penicillin/streptomycin. For the K562 cells transfected with DC-SIGN (a gift from Dr. A. Corbi, Madrid, Spain), 0.3 mg/ml geneticin was included to maintain expression of DC-SIGN. LB 27.4, a murine B cell lymphoma cell line (HB-99; ATCC), was maintained in complete medium. All cell cultures were performed in a 37°C, humidified incubator supplemented with 5% CO2. Isolation of soluble MP was performed as previously described (32, 36). Briefly, culture supernatants of C. neoformans acapsular strain Cap67 (strain 52817; ATCC) were filter-sterilized, concentrated by tangential filtration, and then subjected to Con A affinity chromatography. Bound MP was eluted from the Con A using 0.2 M methyl-α-d-mannopyranoside and dissolved in PBS. The MP fractions were dialyzed against dH2O using 7-kDa cutoff dialysis tubing (Pierce) and lyophilized. After reconstitution with PBS, MP was 0.22-μm filter-sterilized and stored at −80°C. All MP was boiled for 5 min to biologically inactivate any Con A that may have leached from the affinity column. All possible components of the isolation procedure were processed using endotoxin-free conditions and the MP preparation did not stimulate TNF-α release from murine peritoneal macrophages (data not shown). The succinimidyl ester-charged fluorophores, Oregon Green 488 (Molecular Probes), Alexa Fluor 647 (Molecular Probes), and Cy5 (Amersham Biosciences) were dissolved in tissue culture grade DMSO and added to a solution of MP dissolved in 1 M NaHCO3 (pH 9). The mixture was incubated for 1.5 h at 23°C in the dark. Unreacted fluorophores were removed by dialysis, following which the labeled MP was filter-sterilized, and the protein concentration was determined by the bicinchoninic acid method (Pierce). Animal studies were reviewed and approved by the Boston University Medical Center Institutional Review Board. Naive splenocytes from C57BL/6J mice (The Jackson Laboratory) were prepared as previously described (32). Briefly, spleens were gamma-irradiated (500 rad), and macerated through sterile wire mesh. Contaminating erythrocytes were lysed with 0.15 M ammonium chloride, and the RBC-depleted splenocytes were overlaid onto Ficoll-Hypaque and the buffy layer collected. The spleen cell population contains B cells, DC, and macrophages as potential sources of MHC class II Ag presentation. Macrophages were elicited by instilling 2 ml of thioglycolate (REMEL) i.p. in naive 6- to 8-wk-old male C57BL/6 mice (37). After 3 days, mice were euthanized, and the peritoneal cavity was lavaged with 10 ml of complete medium. Cells were suspended in complete medium, and 100 μl containing 1 × 105 cells were added per well to 96-well flat-bottom plates. Cells were allowed to adhere for 2–3 days at 37°C and then washed three times with fresh medium, leaving a homogenous population of strongly adherent macrophages, as visualized under light microscopy. Murine B cells were prepared as previously described with minor modifications (38). Briefly, naive C57BL/6 spleens were macerated in 10 ml of BSS buffer (5.6 mM glucose, 0.44 mM KH2PO4, 1.34 mM Na2HPO47H2O, 0.001% phenol red, 1.45 mM CaCl2H2O, 5.4 mM KCl, 138 mM NaCl, 1 mM MgCl26H2O, 0.8 mM MgSO47H2O (pH 7.2)). RBC depletion was performed as described, and 3 × 107 cells/ml were incubated for 45 min on ice in a 1/1 mixture of TIB 99 (anti-Thy1.2) and TIB 207 (anti-CD4) supernatant (gifts of Dr. L. Wetzler, Boston Medical Center, Boston, MA). After washing, T cells were lysed in complete media supplemented with fresh rabbit serum (a gift from Dr. L. Wetzler) at 1/20 for 30 min at 37°C. T cell-depleted cells were further separated using a G10 Sephadex column. Splenocytes were allowed to enter the column in 0.5 ml of 37°C complete media at a rate of 1 drop/2 s. Cell-loaded columns were incubated at 37°C for 1 h, followed by B cell elution with 3 ml of complete media. To remove any debris, eluted B cells were then underlaid with 2 ml of 23°C B cell Ficoll (9.8% Ficoll (Sigma-Aldrich)/9.6% Hypaque (Winthrop Pharmaceuticals), centrifuged, and washed. Murine DC were prepared using CD11c+ isolation magnetic beads (Miltenyi Biotec) according to the manufacturer’s protocol with minor modification. Briefly, spleens were injected and diced in 10 ml of HBSS containing 400 U/ml collagenase D (Boehringer Mannheim) at 37°C for 1 h. Remaining spleen was macerated into a single-cell suspension and resuspended in 10 ml of ice-cold degassed MACS buffer (2 mM EDTA, 0.5% BSA in PBS (pH 7.2)). To reduce nonspecific Fc receptor binding, the cells were adjusted to 108 cells/ml in 1 mg/ml murine IgG isotype control solution (1/1/1 mixture of IgG1, IgG2a, and IgG2b) for 30 min at 4°C. To this mixture, anti-CD11c-coated magnetic beads were added for 20 min at 4°C. Labeled cells passed through a MS+ column fitted with a preseparation filter (Miltenyi Biotec). Nonlabeled cells were collected in the flow-through fraction. After removing the MS+ column from the magnetic field, bead-labeled cells were eluted, counted, and resuspended in complete media. Following positive isolation from naive splenocytes, the resulting CD11c− nonbinding cellular flow-through fraction was collected. To ensure any remaining CD11c+ DCs were depleted, the flow-through fraction was subjected to a second round of positive isolation and then purified over a Ficoll-Hypaque gradient. As a control, naive splenocytes were subjected to the equivalent steps, excluding the CD11c beads. Human DC were obtained as described (39). Briefly, peripheral blood was obtained by venipuncture following informed consent from healthy volunteers using a protocol approved by the Boston University Medical Center Institutional Review Board. Blood was anticoagulated with heparin (American Pharmaceutical Partners), diluted 1/1 with HBSS (BioWhittaker), and PBMC-purified over a Ficoll-Hypaque (Axis-Shield) gradient. PBMC (1–3 × 105/well) were added to a six-well plate for 2 h at 37°C to allow monocyte adherence, and then washed to remove nonadherent cells. HM-DC were then obtained by culture for 7 days in 50 ng/ml recombinant human IL-4 (BD Pharmingen) and 150 ng/ml recombinant human GM-CSF (Immunex). The two techniques used to assay cellular uptake of MP were flow cytometry and microplate fluorometry. For the flow cytometry assay, a suspension containing 105–106 cells was incubated at 37°C for the indicated time with fluorescent-labeled MP in the presence or absence of mannosylated inhibitors. Cells were washed and analyzed on a FACScan (BD Biosciences), FACSCalibur (BD Biosciences), or MoFlo cell sorter (DakoCytomation). For adherent cells, a similar technique was used except the cells were incubated in 24-well plates with fluorescent ligand, washed, and then detached using 2 mM EDTA before analysis by FACS. Uptake is expressed as the fluorescence geometric mean from an electronically gated live cell population. To analyze uptake by microplate fluorometry, cells were cultured in 96-well flat-bottom plates (adherent cells) or added into V-bottom plates (suspension cells), washed twice with HBSS supplemented with 1 mg/ml BSA, and then incubated with Oregon green-labeled MP (MP-OG) in the absence or presence of 1 mg/ml mannan in a final volume of 100 μl. Cells were washed three times, and then lysed using 50 μl of 0.1% Triton X-100 at 23°C for 15 min. Lysates were transferred to black plastic 96-well microplates (GENios; Tecan) and fluorescence detected on a microplate reader fitted with fluorescein excitation (485 nm) and detection (535 nm) filters (GENios; Tecan). The microplate reader was set to average three detection flashes at optimal gain. Uptake of MP-OG was expressed in mean fluorescence units from triplicate samples. Analysis of total protein in lysates using bicinchoninic acid showed no significant difference between wells (data not shown). Flow cytometry and microplate fluorometry do not differentiate between surface binding and internalization of MP. 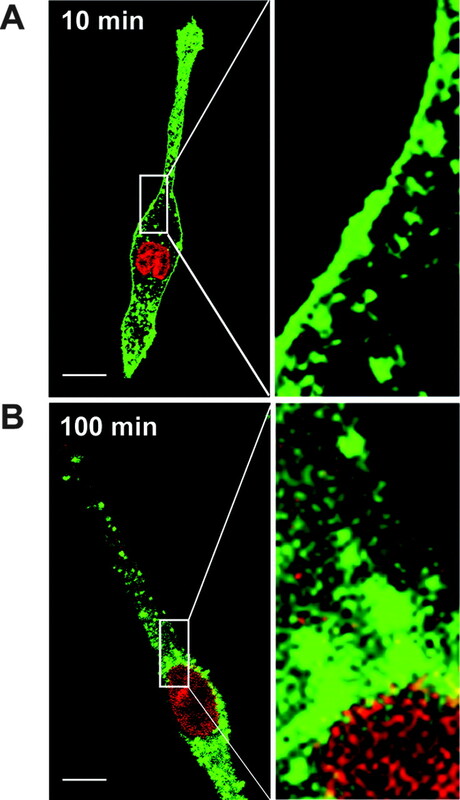 Therefore, “capture” or “uptake” is used to describe an increase in fluorescence following incubation of cells with labeled MP. The CD4+ T cell hybridoma cell line used in these studies, P1D6, has been previously described (32) and is specific for an epitope found in the cryptococcal MP, MP98 (GenBank accession no. AF361369). Thus in the presence of an APC and MP98, P1D6 will secrete IL-2. Briefly, 105 hybridoma cells were cocultured with the indicated number of irradiated (500 rad) APC per well in the presence or absence of Ag and mannosylated inhibitors in a final volume of 200 μl for 24 h. Alternatively, purified DC were pulsed for the indicated times, in the presence or absence of mannosylated inhibitors and MP, washed twice, and then cocultured with P1D6. The degree of T cell activation was determined by bioassay using the IL-2-dependent CTLL-2 cell line, as previously described (32). HM-DC adhered to glass-bottom confocal dishes (MatTek) were incubated with fluorescently conjugated ligand in a final volume of 100 μl of HBSS or RPMI 1640 at 37°C for the indicated time. Surface labeling of cells was accomplished by incubating at 4°C with labeled ligand. Cells were washed and stored on ice until imaged. For Ab colocalization, cells were preincubated at 4°C with 0.25 μg/ml FITC-conjugated mouse anti-human MMR (BD Pharmingen), FITC-conjugated mouse anti-human DC-SIGN (BD Pharmingen), or FITC-conjugated isotype control (Caltag Laboratories) for 20 min before incubation with labeled MP at 37°C. To demonstrate nuclear staining, TO-PRO-3, a nucleic acid-specific fluorochrome (Molecular Probes) was used. DC were fixed with 2% formaldehyde for 20 min at room temperature, permeabilized with 0.2% saponin/0.05% NaN3, and treated with 10 μg/ml RNase for 10 min at 37°C. After washing, cells were incubated with 10 μM TO-PRO-3 for 5–10 min at room temperature, washed once, and stored in HBSS on ice until imaged. All samples were imaged using a ×60 oil immersion objective on a Zeiss Axiovert Confocal Scanning Microscope. The confocal argon and neon lasers were set at 75 and 80% of maximum energy output, respectively. The pinhole for both channels was set to collect sections measuring between 0.9 and 1.0 μm. The detector filter bandwidths were selected to ensure no cross-bleeding from one channel into another. Single-color controls were included in each experiment to confirm the settings on the confocal microscope (data not shown). Images were collected from a mean of four scans at a resolution of 512 × 512 pixels. Images were saved and analyzed using laser scanning microscope software (LSM 5 Image Browser; Zeiss). Student’s t test was used for statistical comparison (Microsoft Excel; Microsoft). Values for p < 0.05 were considered statistically significant. The Bonferroni correction was used for multiple comparisons. Although previously reported data demonstrated that MP potently stimulate CD4+ T cells in an MHC class II-restricted fashion (32), the studies used unfractionated splenocytes as a source of APC. DC, B cells, and macrophages are splenic residents all known to possess mannose receptor and the ability to present Ag in a MHC class II-restricted fashion (6, 7, 10, 12, 20, 40, 41, 42, 43, 44, 45). To further characterize the contribution of each of the APC population in presenting glycoantigen to T cells, whole splenic cells from naive mice were subjected to positive and negative selection strategies. Using negative depletion, B cells were purified from naive splenocytes by Ab-mediated complement lysis of T cells. By FACS analysis, purity of the B cell populations was consistently ≥95% as measured by surface staining for I-Ab and B220 (data not shown). Moreover, the purified B cell population was negative for the pan-T cell marker, CD3 (data not shown). B cells were used immediately following isolation due to their limited viability when cultured without stimulation (38). Murine DC were purified from naive spleen using CD11c+ magnetic bead isolation. Purity of the murine DC population was measured to be 85–90% by FACS analysis of surface CD11c+ following two rounds of positive isolation. In addition, the cells were I-Ab-positive, but CD3- and B220-negative (data not shown). Macrophages were isolated using thioglycolate induction from the peritoneal cavity. To determine the dominant APC, cocultures were performed maintaining a constant MP concentration (20 μg/ml) and number of MP-reactive T cell hybridoma cells (P1D6, 105/well). The number of APC was titrated using 2-fold dilutions starting from 25 × 103/well. Supernatants then were analyzed for IL-2 production as a measure of P1D6 stimulation. Only DC were capable of stimulating P1D6 over background levels (APC-T cell coculture with no Ag) (Fig. 1⇓, left panel). Peritoneal macrophages and splenic B cells were unable to stimulate the T cell hybridoma cells even at the highest APC to T cell ratio tested (Fig. 1⇓, middle and right panels). Stimulation of MP-specific T cells with purified APC. Purified murine splenic CD11c+ cells, splenic B cells, and peritoneal macrophages (Mφ) were incubated with P1D6 (1 × 105) and MP (20 μg/ml) for 24 h. Supernatants were assayed for IL-2 production using the CTLL-2 bioassay. Data are representative of two experiments performed in triplicate. Results of the positive isolation suggest that splenic CD11c+ DC comprise the immunodominant APC population responsible for the MP-specific stimulation of T cell hybridoma cells. Yet, comparisons were performed using thioglycolate-induced peritoneal macrophages, which may not be the equivalent to resident splenic macrophages (46). Therefore, naive splenocytes were depleted of the CD11c+ population by negative selection, leaving native splenic B cells and macrophages as sources of APC. Control splenocytes, but not CD11c-depleted splenocytes, possessed the necessary APC population for MP-dependent stimulation of P1D6 (Fig. 2⇓). The CD11c-depleted population was unable to stimulate P1D6 above background levels of IL-2 detection at MP concentrations of up to 50 μg/ml (data not shown). In contrast, maximum stimulation by control splenocytes was seen at an MP concentration of 12.5 μg/ml (data not shown). Furthermore, the purified CD11c+ population obtained following the negative selection maintained a stimulatory capacity (Fig. 2⇓). Taken together, these data implicate the CD11c+ DC population as the major immunodominant APC required for MP-dependent stimulation of P1D6. Effect of CD11c+ cell depletion on the stimulation of MP-specific T cell hybridoma cells. Splenocytes were left unfractionated (Control splenocytes, 2 × 105 cells/well) or separated into CD11c− (CD11c-depleted splenocytes, 2 × 105 cells/well) and CD11c+ (CD11c-purified population, 1 × 105/well) fractions. Splenocytes then were incubated with P1D6 cells (1 × 105 cells/well) and 10 μg/ml MP for 24 h at 37°C. T cell stimulation was assessed as in Fig. 1⇑. Data are representative of two to three experiments performed in duplicate or triplicate. ∗, p < 0.05 comparing control or CD11c-purified population to CD11c-depleted population. Although DC functionally serve as the immunodominant APC, the mechanisms underlying this phenomenon were unclear. Macrophages, DC, and B cells express receptors shown to recognize MP, including mannose receptors. To determine whether there were differences in the kinetics and ability of these APC populations to acquire and capture MP, fluorescent binding assays were performed. 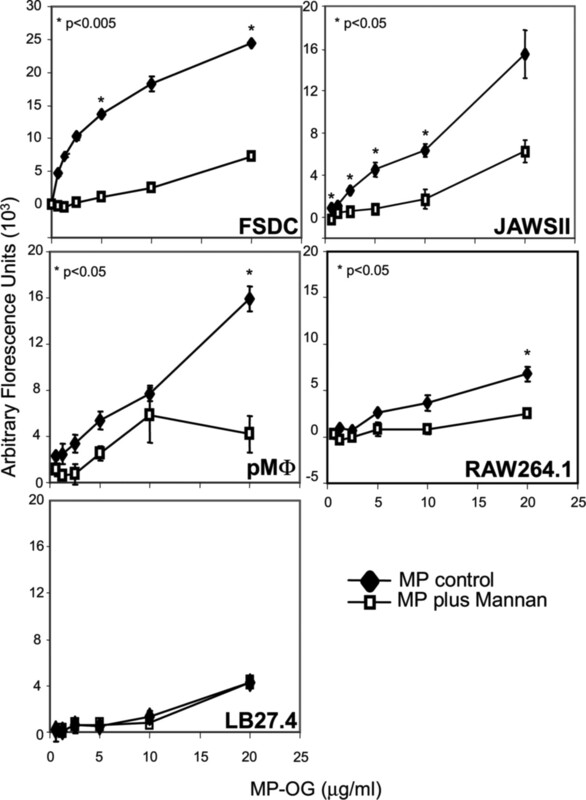 Primary APCs, as well as immortalized cell lines, were incubated for 1 h with MP-OG in the presence or absence of the mannose receptors competitive inhibitor, soluble mannan. The two DC cell lines tested, FSDC and JAWSII, demonstrated the most robust uptake of MP-OG (Fig. 3⇓). This uptake was inhibited with mannan, suggesting dependence on mannose receptors. Primary peritoneal macrophages, as well as a murine macrophage cell line, RAW 264.1, captured lesser amounts of MP-OG (Fig. 3⇓). Conversely, the B cell line LB 27.4 captured relatively small amounts of MP-OG, which was not inhibited by mannan (Fig. 3⇓). By FACS analysis, similar results were obtained examining capture of MP-OG by naive primary splenic B cells. Splenic B cells incubated with 10 μg/ml MP-OG for 1 and 3 h at 37°C demonstrated a minor increase in their mean geometric fluorescence index from 5 to 35, which was unchanged in the presence of mannan, suggesting fluid-phase uptake rather than a receptor mediated process (data not shown). Capture MP-OG by APC. APC were incubated with the indicated concentration of MP-OG in the absence (MP control, ♦) or presence (MP plus mannan, □) of 1 mg/ml mannan for 1 h at 37°C in HBSS supplemented with 1 mg/ml BSA. Cells were washed and lysed with 0.1% Triton X-100 in PBS, and lysates were assayed by fluorometry. A, Mature murine FSDC. B, Murine immature DC cell line (JAWSII). C, Thioglycolate-induced peritoneal macrophages (pMφ). D, RAW264.1 murine macrophage cell line. E, Murine B cell line LB 27.4. Uptake is expressed as arbitrary fluorescence units. Data represent one to four experiments performed in duplicate. ∗, p < 0.05 comparing control to mannan treatment. To further dissect the mechanism of MP-OG capture by DC, HM-DC were generated from monocytes in the presence of GM-CSF and IL-4 (47). HM-DC expressed surface markers consistent with immature DC, including CD1a+, mannose receptor (DC-SIGN+, MMR+), undetectable CD14, and low levels of the activation markers CD80, CD83, and CD86 (data not shown). To further investigate the role of mannose receptors, two-color FACS was used to correlate surface expression of MMR on HM-DC with MP-OG uptake. Approximately 95% of the HM-DC expressed MMR, and expression of MMR strongly correlated with MP-OG capture (Fig. 4⇓A). MP capture was dependent on mannose receptor as the addition of mannosylated inhibitors (methyl-α-d-mannopyranoside, mannan, and unlabeled MP) strongly inhibited uptake, whereas the control sugar, methyl-α-d-galactopyranoside, did not inhibit (Fig. 4⇓A). 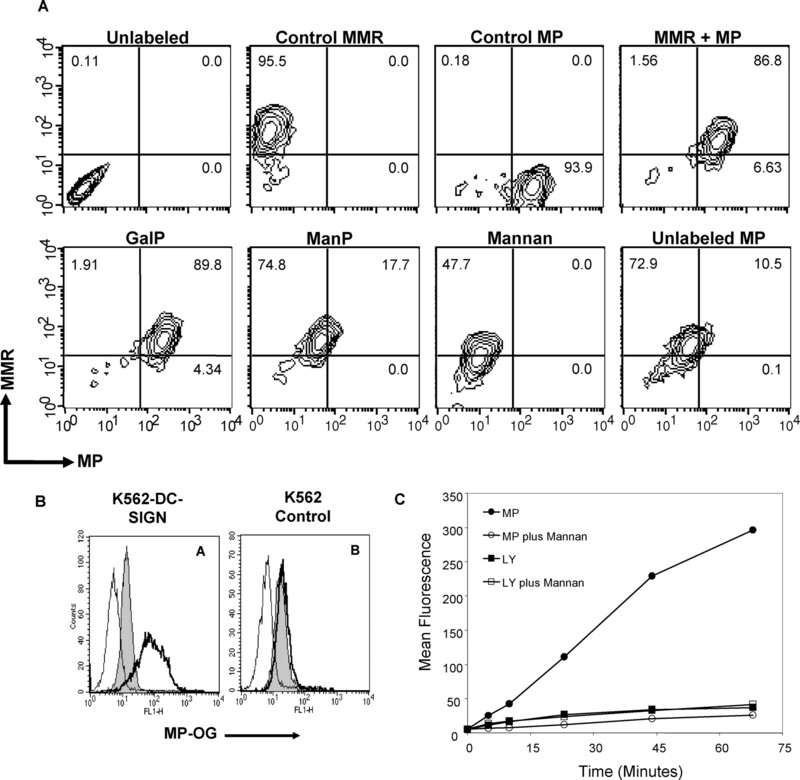 To investigate the role of DC-SIGN as a putative receptor for MP, the capacity of K562 cell lines stably transfected with human DC-SIGN to capture MP-OG was investigated. Following 15 min of incubation with MP-OG, DC-SIGN-transfected cells demonstrated a 10-fold fluorescence increase as compared with untransfected K562 cells. Moreover, this excess binding of MP-OG was competed out by mannan (Fig. 4⇓B). K562 wild-type cells demonstrated a minor amount of MP-OG uptake, which was not inhibited with mannan, suggesting pinocytosis (Fig. 4⇓B). Effect of mannosylated inhibitors on the capture of MP by mannose receptor. A, HM-DC were incubated with MP-OG (1 μg/ml) in the presence or absence of inhibitors for 30 min at 37°C in RPMI 1640, washed, and then stained for surface expression of MMR. Top panels show unlabeled cells, MMR staining only (control MMR; no MP-OG), MP-OG uptake only (control MP; no MMR staining), and uninhibited MMR staining plus MP-OG uptake (MMR+MP). Bottom panels show MMR staining and MP-OG uptake plus the following inhibitors: 50 mM methyl-α-d-galactopyranoside (GalP), 50 mM methyl-α-d-mannopyranoside (ManP), 1 mg/ml Mannan, 50 μg/ml unlabeled MP. Two-color FACS was performed on a FACScan and analyzed by CellQuest. Values in the plots are the percentage of cells in each quadrant. B, K562 cells transfected with DC-SIGN (A) and K562 control cells (B) were incubated with 5 μg/ml MP-OG for 15 min at 37°C in HBSS supplemented with 1 mg/ml BSA (dark line histogram) or in the presence of mannan 1.25 mg/ml (gray-filled histogram). Background staining of cells is indicated by the thin line histogram. C, Kinetics of uptake of MP-OG (MP; 0.1 μg/ml) or Lucifer Yellow (LY; 250 μg/ml) by HM-DC in the presence or absence of mannan (1 mg/ml). Following uptake for the indicated time, cells were detached with 2 mM EDTA, washed, and analyzed by FACScan. Fluorescence is expressed as the geometric mean. Having determined that HM-DC capture MP via a process dependent upon mannose receptor, the kinetics were then assessed. Using FACS, HM-DC demonstrated robust uptake of MP-OG resulting in 30-fold peak increases in the mean fluorescence index over the 70 min incubation period (Fig. 4⇑C). The murine DC lines, FSDC and JAWSII, demonstrated similar kinetics of MP uptake (data not shown). The parabolic shape of the curve, with rapid initial uptake followed by a leveling off, suggests a receptor-mediated process. Uptake of MP was nearly completely inhibited by mannan, although there was still a small, but measurable linear increase of fluorescence. Although DC are known to possess powerful endocytic receptor-mediated mechanisms, fluid-phase uptake is a constitutive process used by DC. To test whether this small amount of uptake was due to receptor-independent fluid phase uptake, the fluorescent pinocytosis marker, Lucifer yellow (18), was incubated with HM-DC. The kinetics of Lucifer yellow uptake were linear and paralleled the uptake of MP-OG in the presence of mannan (Fig. 4⇑C). Taken together, these data suggest that the dominant means of MP-OG capture by DC is mannose receptor-mediated. Upon inhibition of mannose receptor, fluid phase uptake appears to be the only remaining route of MP entry into DC. Having demonstrated rapid uptake of MP by mannose receptor, we sought to determine the significance of this uptake toward the activation of T cells. 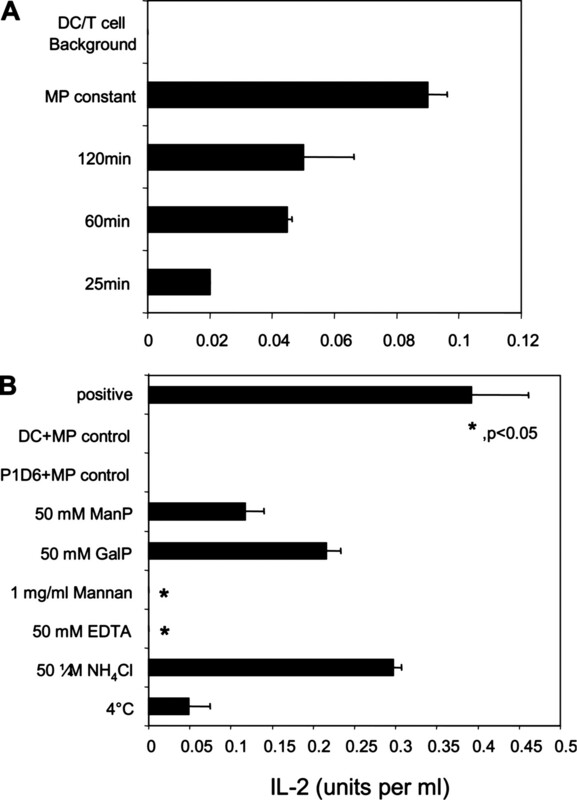 Purified splenic DC were pulsed with MP for various time points, and then cultured with the MP-reactive T cell hybridoma P1D6 for 18 h. A time-dependent increase in IL-2 production was demonstrated with increasing MP pulse durations of 25, 60, and 120 min (Fig. 5⇓A). Effect of pulse time and inhibitors on the stimulation of MP-specific T cells. A, CD11c+-purified splenic DC (1 × 105/well) were pulsed with MP (40 μg/ml) for the time points indicated in HBSS supplemented with 1 mg/ml BSA, washed, and then coincubated with P1D6 cells (1 × 105 per well) for 18 h. B, CD11c+-purified splenic DC (1 × 105/well) were pulsed with MP (60 μg/ml) with or without the indicated inhibitors for 30 min in HBSS supplemented with 1 mg/ml BSA buffer, washed, and coincubated with P1D6 cells for 18 h at 37°C. Positive control is defined as DC pulsed at 37°C in the absence of inhibitors. Background was determined by incubating DC or P1D6 with MP only. For experiment, IL-2 was assayed using the CTLL-2 bioassay as a measure of T cell activation. Data are mean ± SEM and are representative of one to five experiments. ∗, p < 0.05 comparing the control sugar methyl-α-d-galactopyranoside (GalP) to monovalent sugar methyl-α-d-mannopyranoside (ManP) and to other inhibitors. The fluorescent uptake studies suggest that at early time points, capture of MP is almost totally dependent upon mannose receptor-mediated processes. To examine the functional consequences of this observation, the next set of experiments examined the effect of blockers of the mannose receptor on the capacity of DC to present mannose receptor Ags to T cells. The monovalent sugar, methyl-α-d-mannopyranoside, produced more significant inhibition of IL-2 production by T cell hybridoma cells, as compared with the control sugar, methyl-α-d-galactopyranoside (Fig. 5⇑B). Results with mannan were even more impressive, with complete inhibition of IL-2 production observed. Many members of the mannose receptor family require the divalent cation Ca2+ for function (10). Chelation of Ca2+ using EDTA during the pulse period resulted in complete inhibition of T cell activation. The alkalizing agents ammonium chloride had no effect on stimulation, indicating that acidification was not essential during the pulse period. Mannose receptor-mediated uptake is rapid and requires the rearrangement of the cytoskeleton to invaginate and endocytose captured Ag (17, 23, 42). To temporarily inhibit cytoskeletal-dependent receptor-mediated endocytosis, DC were pulsed with MP at 4°C for 30 min to allow only for receptor-ligand interactions. Cells were washed and then incubated at 37°C with P1D6 cells. IL-2 production was significantly decreased, although stimulation was still 13% of maximal response, which may represent the MP that had bound to surface mannose receptor (Fig. 5⇑B). Next, the location of MP captured by DC was assessed by confocal microscopy. MP-OG was incubated with FSDC for 5–90 min, fixed, and then the nucleus was outlined with the nucleic acid-specific stain TO-PRO-3. At 10 min, MP-OG appeared localized mostly at and just inside the cell membrane, with little MP seen in the perinuclear region (Fig. 6⇓A). However, at later time points (100 min), MP-OG appeared concentrated in perinuclear compartments (Fig. 6⇓B). MP localizes to a perinuclear compartment in DC. FSDC were incubated with MP-OG (20 μg/ml) for 10 min (A), or 100 min (B), washed, and fixed with 10% formalin. The nucleus was stained red with TO-PRO-3. Cells were analyzed by confocal microscopy. Bar denotes 10 μM scale. Expanded image (right) of views (white rectangle) are shown. Data are representative of three to five independent experiments. As shown, our previous (32) and current data suggest that MMR and DC-SIGN are capable of binding MP. These receptors are expressed on DC and have been demonstrated to capture pathogens and mannosylated ligands destined for degradation and Ag presentation (18, 20, 21, 22). To study further the involvement of these receptors in the capture and internalization of MP on HM-DC, FITC-conjugated mAb directed against MMR or DC-SIGN were incubated with HM-DC at 4°C to prevent internalization. Free mAb was washed away and MP-labeled with Alexa Fluor 647 was incubated with the Ab-labeled HM-DC at 37°C. Both MMR and DC-SIGN appear to colocalize with significant amounts of (although not all) MP labeled with Alexa Fluor 647-positive vesicles (Fig. 7⇓, A and B). As MP traffics into the DC, MP-positive vesicles begin to accumulate in a perinuclear compartment with portions continuing to colocalize with DC-SIGN and MMR. A significant portion of the surface MMR and DC-SIGN remains present throughout the uptake experiment. The Abs directed against MMR and DC-SIGN are nonblocking Abs as they did not inhibit HM-DC-mediated uptake of MP, as measured by flow cytometry (data not shown). Endocytosis of MP in HM-DC. HM-DC were preincubated with FITC-labeled anti-human MMR mAb (0.25 μg/ml) (A) or FITC-labeled anti-human DC-SIGN mAb (0.25 μg/ml) (B) on ice to prevent internalization of Ab. Cells were then incubated for 30 min at 37°C with Alexa Fluor 647-labeled MP (20 μg/ml). No detectable fluorescence was observed with the use of FITC-labeled isotype-matched control Ab (data not shown). C, HM-DC were incubated with DQ-OVA (10 μg/ml) and Alexa Fluor 647-labeled MP (25 μg/ml) for 1 h at 37°C. For experiment, cells were imaged on a Zeiss laser scanning confocal microscope. Bar denotes 10 μM scale. Expanded image (right) of views (white rectangle) are shown. Expanded view shows merge (top), green channel (middle), and red channel (bottom) image. Images are representative of three to four independent experiments. In the last set of experiments, we investigated the fate of MP during later stages of Ag processing. Using the self-quenched marker DQ-OVA, the process of Ag degradation can be visualized. DQ-OVA is a MMR ligand (48, 49) consisting of naturally mannosylated OVA extensively labeled with the fluorochrome BODIPY. Due to oversaturation with BODIPY, self-quenching occurs. Once introduced into the Ag presentation pathway, lysosomal action degrades DQ-OVA into smaller fragments such that BODIPY molecules, now sufficiently distanced from each other, begin to fluoresce. Thus, visualization will only occur if the DQ-OVA degrades within an endo-lysosomal compartment. Control experiments show that at 5–20 min postpulse, a dramatic increase in BODIPY fluorescence occurs and that the fluorescence is localized to an endo-lysosomal compartment (data not shown). Coincubation of DQ-OVA and MP-labeled with Alexa Fluor 647 revealed that both molecules colocalize to the same endo-lysosomal compartment (Fig. 7⇑C). Interestingly, as Ag is degraded, processed MP and DQ-OVA colocalize at most, but not all, locations along protruding extensions emanating from the central compartment. This suggests that both molecules are being processed in similar compartments (Fig. 7⇑C, merge). Earlier studies demonstrated that whole splenocytes required mannose receptor for MP-dependent T cell activation, but did not address which cell populations were responsible for Ag presentation. Through positive and negative selection strategies, this work establishes that DC capture and present MP to T cells. DC express a wide variety of lectin receptors with which MP capture is possible (6, 7, 10, 12, 20) and (reviewed in Ref.44). Incubation of MP with HM-DC showed rapid rates of uptake followed by saturation, suggesting a receptor-mediated process is primarily responsible for MP capture (50, 51, 52). B cells, in contrast, did not appear to capture MP via a receptor-mediated process and were incapable of T cell stimulation. B cells express a more limited repertoire of C-type lectins including CD23 (low affinity IgE receptor (42)), CD72 (43), CD69 (40), DC immunoreceptor (43), and DC-associated lectin-1 (41). Other than CD23, and possibly CD69, which have affinities for galactose (40, 53), many of the ligands for these receptors have yet to be described. However, based on our binding studies, none appears to have a high affinity for MP. Macrophages were the first cell type described to express the MMR (50). But as compared with DC, their lectin receptor repertoire is not as diverse (reviewed in Ref.44). Therefore, a partial ability to capture sufficient MP may explain the paucity of T cell stimulation by both B cells and macrophages. Also, variations among macrophage and B cell populations from different anatomical sites have been described (54, 55), and it is possible that macrophages and B cells from tissue sources that we did not test may have enhanced capacity for MP uptake and presentation. Furthermore, T cell stimulation also requires costimulation. Although all three major APC populations are capable of up regulating and expressing costimulatory molecules, a prerequisite inflammatory signal may be required. Mannose receptor appear to be the primary receptor class responsible for MP uptake, as use of mannosylated inhibitors reduces uptake to rates equivalent to that seen with the pinocytosis marker Lucifer yellow (18). As previously described, the MMR was determined to bind MP (32). Not surprisingly, our studies using stable transfectants show that MP is also a ligand for DC-SIGN. Ag acquisition through multiple lectin receptor members can increase the efficiency of processing and presentation (19, 20, 22). This redundancy may help provide an explanation to the immunodominance of MP in the development of T cell immunity to C. neoformans. In support of this thought, interfering with mannose receptor on DC through the use of mannosylated inhibitors or EDTA Ca2+ chelation resulted in a significant reduction in stimulation of T cells. Interestingly, both pro- and anti-inflammatory immune responses have been observed following ligation of mannose receptor, with one study suggesting that proinflammatory events follow mannose receptor-dependent phagocytosis but not receptor-mediated endocytosis (56). Recent data by Pietrella et al. (57) demonstrate MMR-dependent proinflammatory effects by cryptococcal MP on DC. However, other studies suggest that MMR ligation may actually result in an anti-inflammatory effect, or skewing of DC subsets into immature forms (58, 59). Although lectin receptors may appear to share a common ability to bind carbohydrate, recognition and functional differences have been described. The best-studied receptors, MMR and DC-SIGN, provide insight to the complexity of the carbohydrate pattern recognition. Surface plasma resonance studies indicate that the MMR has a strong affinity for dimannosides (106 L/mol), whereas DC-SIGN affinity was poor for dimannosides (<104 L/mol) (13). In contrast, DC-SIGN had significantly higher affinity for complex sugars, such as pentameric (Lewisa, Lewisx) or hexameric (Lewisb) carbohydrate structure, and may be binding to internal carbohydrate structures, as opposed to surface epitopes (13). As is suggested by sequence and carbohydrate analysis, cryptococcal MP presents a multivalent mannose platform in the shape of repeating short-chain, O-linked terminal mannose residues at the serine/threonine-rich C terminus, as well as longer N-linkages (30, 31). Further work will be required to better understand, at the molecular level, the interactions between carbohydrate-decorated molecules derived from yeast and receptors found on host cells. Our data do not rule out that other lectin receptors on the surface of DC may also participate in conjunction with the MMR and DC-SIGN in the recognition of MP. Recent discoveries have increased the known receptor repertoire in both major classes of C-type lectin families, type I and type II. For example, the type I C-type lectin, Endo180, has been shown to bind terminal mannose (45) and has intracellular sequence similarity to the MMR (23). Type II C-type lectin receptors include BDCA-2, dectins, Langerin, and DC-associated lectin-1. Moreover, murine receptors with sequence similarity to DC-SIGN that have carbohydrate and pathogen-capturing properties have been described (60). Most of these receptors have yet to be well characterized for natural ligands, specific carbohydrate affinities, and biological function. Furthermore, surface-bound receptors such as the MMR have been described to undergo proteolytic cleavage resulting in a soluble receptor (61), which is theorized to participate in Ag delivery to marginal zone lymphoid cells (62). Thus, the recognition of complex glycoproteins is a multilectin receptor process. FACS analysis and microscopy of human and murine DC demonstrate formation of MP-containing vesicles within minutes of exposure to MP. At later time points, MP localizes to an endo-lysosomal compartment. Both the MMR and DC-SIGN colocalize with MP, supporting a role for each in MP capture. Consistent with this result, cell lines transfected with MMR and DC-SIGN avidly bind MP. The lysosomally activated marker, DQ-OVA, and MP colocalized to an endo-lysosomal compartment, as observed by confocal microscopy. Owing to its mannosylation, DQ-OVA enters cells through mannose receptors and exhibits rapid trafficking to lysosomes (48, 49). “Hair-like” projections from the endo-lysosomal compartment in which both DQ-OVA and Alexa Fluor 647-labeled MP colocalize were observed. Similar projections described as tubular structures emanating from MHC class II containing lysosomal compartments and terminating at the cell membrane have been recently characterized (63, 64, 65). In these systems, internalized Ag localizes to a perinuclear compartment, which is presumed to consist of lysosomes (64). Similar perinuclear localization with tubulation was also noted in MP-containing HM-DC, suggesting the involvement of MHC class II. Indeed, in preliminary studies, we have found colocalization of MHC class II and MP in human DC. Further work will be required to determine the fate of MP postdegradation. In addition to loading onto MHC class II, MP fragments could be cross-presented onto MHC class I or MHC-like molecules such as CD1. The studies presented further define the innate immune response to a class of immunodominant glycoantigens (MP) derived from a pathogenic fungus. Our data identify the DC as the foremost APC in the recognition, capture, and presentation of MP. Furthermore, DC accomplish this result through the near exclusive use of multiple mannose receptor members. Additional characterization of the fate of MP following mannose receptor-mediated uptake, including the events by which MP is processed and presented, should provide insight into the mechanisms by which an acquired immune response to cryptococcosis occurs. We thank Dr. Paola Ricciardi-Castagnoli for the FSDC cell line and Dr. Angel Corbi for the K562 cells transfected with DC-SIGN. ↵1 This work was supported in part by National Institutes of Health Grants RO1 AI25780 and RO1 AI37532. M.K.M. is the recipient of a Graduate Research Student Fellowship from the Division of Graduate Medical Sciences at Boston University School of Medicine. ↵2 Current address: Internal Medicine Residency Training Program, Department of Internal Medicine, Massachusetts General Hospital, Boston, MA 02114. ↵4 Abbreviations used in this paper: CBR, carbohydrate-binding receptor; MMR, macrophage mannose receptor; DC, dendritic cell; DC-SIGN, DC-specific ICAM-3-grabbing nonintegrin; HM-DC, human monocyte-derived DC; FSDC, fetal skin DC; MP, mannoprotein; MP-OG, Oregon green-labeled MP. Apostolopoulos, V., N. Barnes, G. A. Pietersz, I. F. McKenzie. 2000. Ex vivo targeting of the macrophage mannose receptor generates anti-tumor CTL responses. Vaccine 18: 3174-3184. Karanikas, V., G. Thynne, P. Mitchell, C. S. Ong, D. Gunawardana, R. Blum, J. Pearson, J. Lodding, G. Pietersz, R. Broadbent, et al 2001. Mannan mucin-1 peptide immunization: influence of cyclophosphamide and the route of injection. J. Immunother. 24: 172-183. Berlyn, K. A., B. Schultes, B. Leveugle, A. A. Noujaim, R. B. Alexander, D. L. Mann. 2001. Generation of CD4+ and CD8+ T lymphocyte responses by dendritic cells armed with PSA/anti-PSA (antigen/antibody) complexes. Clin. Immunol. 101: 276-283. Appelmelk, B. J., I. van Die, S. J. van Vliet, C. M. Vandenbroucke-Grauls, T. B. Geijtenbeek, Y. van Kooyk. 2003. Cutting edge: carbohydrate profiling identifies new pathogens that interact with dendritic cell-specific ICAM-3-grabbing nonintegrin on dendritic cells. J. Immunol. 170: 1635-1639.
van Die, I., S. J. van Vliet, A. Kwame Nyame, R. D. Cummings, C. M. Bank, B. Appelmelk, T. B. Geijtenbeek, Y. van Kooyk. 2003. The dendritic cell specific C-type lectin DC-SIGN is a receptor for Schistosoma mansoni egg antigens and recognizes the glycan antigen Lewis-x. Glycobiology 13: 471-478. Tailleux, L., O. Schwartz, J. L. Herrmann, E. Pivert, M. Jackson, A. Amara, L. Legres, D. Dreher, L. P. Nicod, J. C. Gluckman, et al 2003. DC-SIGN is the major Mycobacterium tuberculosis receptor on human dendritic cells. J. Exp. Med. 197: 121-127. Tassaneetrithep, B., T. H. Burgess, A. Granelli-Piperno, C. Trumpfheller, J. Finke, W. Sun, M. A. Eller, K. Pattanapanyasat, S. Sarasombath, D. L. Birx, et al 2003. DC-SIGN (CD209) mediates Dengue virus infection of human dendritic cells. J. Exp. Med. 197: 823-829. Lee, S. J., S. Evers, D. Roeder, A. F. Parlow, J. Risteli, L. Risteli, Y. C. Lee, T. Feizi, H. Langen, M. C. Nussenzweig. 2002. Mannose receptor-mediated regulation of serum glycoprotein homeostasis. Science 295: 1898-1901. Geijtenbeek, T. B., R. Torensma, S. J. van Vliet, G. C. van Duijnhoven, G. J. Adema, Y. van Kooyk, C. G. Figdor. 2000. Identification of DC-SIGN, a novel dendritic cell-specific ICAM-3 receptor that supports primary immune responses. Cell 100: 575-585. Stahl, P. D., R. A. Ezekowitz. 1998. The mannose receptor is a pattern recognition receptor involved in host defense. Curr. Opin. Immunol. 10: 50-55. Mullin, N. P., P. G. Hitchen, M. E. Taylor. 1997. Mechanism of Ca2+ and monosaccharide binding to a C-type carbohydrate-recognition domain of the macrophage mannose receptor. J. Biol. Chem. 272: 5668-5681. East, L., C. M. Isacke. 2002. The mannose receptor family. Biochim. Biophys. Acta 1572: 364-386. Frison, N., M. E. Taylor, E. Soilleux, M.-T. Bousser, R. Mayer, M. Monsigny, K. Drickamer, A.-C. Roche. 2003. Oligolysine-based oligosaccharide clusters: selective recognition and endocytosis by the mannose receptor and DC-SIGN. J. Biol. Chem. 278: 23922-23929. Valladeau, J., O. Ravel, C. Dezutter-Dambuyant, K. Moore, M. Kleijmeer, Y. Liu, V. Duvert-Frances, C. Vincent, D. Schmitt, J. Davoust, et al 2000. Langerin, a novel C-type lectin specific to Langerhans cells, is an endocytic receptor that induces the formation of Birbeck granules. Immunity 12: 71-81. Schweizer, A., P. D. Stahl, J. Rohrer. 2000. A di-aromatic motif in the cytosolic tail of the mannose receptor mediates endosomal sorting. J. Biol. Chem. 275: 29694-29700. Tan, M. C., A. M. Mommaas, J. W. Drijfhout, R. Jordens, J. J. Onderwater, D. Verwoerd, A. A. Mulder, A. N. van der Heiden, D. Scheidegger, L. C. Oomen, et al 1997. Mannose receptor-mediated uptake of antigens strongly enhances HLA class II-restricted antigen presentation by cultured dendritic cells. Eur. J. Immunol. 27: 2426-2435. Schjetne, K. W., K. M. Thompson, T. Aarvak, B. Fleckenstein, L. M. Sollid, B. Bogen. 2002. A mouse Cκ-specific T cell clone indicates that DC-SIGN is an efficient target for antibody-mediated delivery of T cell epitopes for MHC class II presentation. Int. Immunol. 14: 1423-1430. Engering, A., T. B. Geijtenbeek, S. J. van Vliet, M. Wijers, E. van Liempt, N. Demaurex, A. Lanzavecchia, J. Fransen, C. G. Figdor, V. Piguet, Y. van Kooyk. 2002. The dendritic cell-specific adhesion receptor DC-SIGN internalizes antigen for presentation to T cells. J. Immunol. 168: 2118-2126. Howard, M. J., C. M. Isacke. 2002. The C-type lectin receptor Endo180 displays internalization and recycling properties distinct from other members of the mannose receptor family. J. Biol. Chem. 277: 32320-32331. Husain, S., M. M. Wagener, N. Singh. 2001. Cryptococcus neoformans infection in organ transplant recipients: variables influencing clinical characteristics and outcome. Emerg. Infect. Dis. 7: 375-381. Mitchell, T. G., J. R. Perfect. 1995. Cryptococcosis in the era of AIDS: 100 years after the discovery of Cryptococcus neoformans. Clin. Microbiol. Rev. 8: 515-548. Dixon, D. M., A. Casadevall, B. Klein, L. Mendoza, L. Travassos, G. S. Deepe, Jr. 1998. Development of vaccines and their use in the prevention of fungal infections. Med. Mycol. 36: 57-67. Murphy, J. W., R. L. Mosley, R. Cherniak, G. H. Reyes, T. R. Kozel, E. Reiss. 1988. Serological, electrophoretic, and biological properties of Cryptococcus neoformans antigens. Infect. Immun. 56: 424-431. Mansour, M. K., L. E. Yauch, J. B. Rottman, S. M. Levitz. 2004. Protective efficacy of antigenic fractions in mouse models of cryptococcosis. Infect. Immun. 72: 1746-1754. Murphy, J. W., F. Schafer, A. Casadevall, A. Adesina. 1998. Antigen-induced protective and nonprotective cell-mediated immune components against Cryptococcus neoformans. Infect. Immun. 66: 2632-2639. Levitz, S. M., S. Nong, M. K. Mansour, C. Huang, C. A. Specht. 2001. Molecular characterization of a mannoprotein with homology to chitin deacetylases that stimulates T cell responses to Cryptococcus neoformans. Proc. Natl. Acad. Sci. USA 98: 10422-10427. Huang, C., S. H. Nong, M. K. Mansour, C. A. Specht, S. M. Levitz. 2002. Purification and characterization of a second immunoreactive mannoprotein from Cryptococcus neoformans that stimulates T-cell responses. Infect. Immun. 70: 5485-5493. Mansour, M. K., L. S. Schlesinger, S. M. Levitz. 2002. Optimal T cell responses to Cryptococcus neoformans mannoprotein are dependent on recognition of conjugated carbohydrates by mannose receptors. J. Immunol. 168: 2872-2879. Reeke, G. N., Jr, J. W. Becker, B. A. Cunningham, G. R. Gunther, J. L. Wang, G. M. Edelman. 1974. Relationships between the structure and activities of concanavalin A. Ann. NY Acad. Sci. 234: 369-382. Mansour, M. K., S. M. Levitz. 2003. Fungal mannoprotein: the sweet path to immunodominance. Am. Soc. Microbiol. NEWS 69: 595-600. Girolomoni, G., M. B. Lutz, S. Pastore, C. U. Assmann, A. Cavani, P. Ricciardi-Castagnoli. 1995. Establishment of a cell line with features of early dendritic cell precursors from fetal mouse skin. Eur. J. Immunol. 25: 2163-2169. Cherniak, R., J. B. Sundstrom. 1994. Polysaccharide antigens of the capsule of Cryptococcus neoformans. Infect. Immun. 62: 1507-1512. Wetzler, L. W., Y. Ho, H. Reiser. 1996. Neisserial porins induce B lymphocytes to express costimulatory B7-2 molecules and to proliferate. J. Exp. Med. 183: 1151-1159. Kelly, R. M., J. Chen, L. E. Yauch, S. M. Levitz. 2005. Opsonic requirements for dendritic cell-mediated responses to Cryptococcus neoformans. Infect. Immun. 73: 592-598. Santis, A. G., M. López-Cabrera, J. Hamann, M. Strauss, F. Sánchez-Madrid. 1994. Structure of the gene coding for the human early lymphocyte activation antigen CD69: a C-type lectin receptor evolutionarily related with the gene families of natural killer cell-specific receptors. Eur. J. Immunol. 24: 1692-1697. Ryan, E. J., A. J. Marshall, D. Magaletti, H. Floyd, K. E. Draves, N. E. Olson, E. A. Clark. 2002. Dendritic cell-associated lectin-1: a novel dendritic cell-associated, C-type lectin-like molecule enhances T cell secretion of IL-4. J. Immunol. 169: 5638-5648. Karagiannis, S. N., J. K. Warrack, K. H. Jennings, P. R. Murdock, G. Christie, K. Moulder, B. J. Sutton, H. J. Gould. 2001. Endocytosis and recycling of the complex between CD23 and HLA-DR in human B cells. Immunology 103: 319-331. East, L., S. Rushton, M. E. Taylor, C. M. Isacke. 2002. Characterization of sugar binding by the mannose receptor family member, Endo180. J. Biol. Chem. 277: 50469-50475. Watanabe, S., T. Kobayashi, H. Okuyama. 1994. Regulation of lipopolysaccharide-induced tumor necrosis factor α production by endogenous prostaglandin E2 in rat resident and thioglycollate-elicited macrophages. J. Lipid Mediat. Cell Signal. 10: 283-294. Romani, N., S. Gruner, D. Brang, E. Kampgen, A. Lenz, B. Trockenbacher, G. Konwalinka, P. O. Fritsch, R. M. Steinman, G. Schuler. 1994. Proliferating dendritic cell progenitors in human blood. J. Exp. Med. 180: 83-93. Boonacker, E., C. J. van Noorden. 2001. Enzyme cytochemical techniques for metabolic mapping in living cells, with special reference to proteolysis. J. Histochem. Cytochem. 49: 1473-1486. Rodriguez, G. M., S. Diment. 1995. Destructive proteolysis by cysteine proteases in antigen presentation of ovalbumin. Eur. J. Immunol. 25: 1823-1827. Stahl, P. D., J. S. Rodman, M. J. Miller, P. H. Schlesinger. 1978. Evidence for receptor-mediated binding of glycoproteins, glycoconjugates, and lysosomal glycosidases by alveolar macrophages. Proc. Natl. Acad. Sci. USA 75: 1399-1403. Reis e Sousa, C., P. D. Stahl, J. M. Austyn. 1993. Phagocytosis of antigens by Langerhans cells in vitro. J. Exp. Med. 178: 509-519. Piemonti, L., P. Monti, P. Allavena, B. E. Leone, A. Caputo, V. Di Carlo. 1999. Glucocorticoids increase the endocytic activity of human dendritic cells. Int. Immunol. 11: 1519-1526. Kijimoto-Ochiai, S., T. Uede. 1995. CD23 molecule acts as a galactose-binding lectin in the cell aggregation of EBV-transformed human B-cell lines. Glycobiology 5: 443-448. Fathi, M., A. Johansson, M. Lundborg, L. Orre, C. M. Skold, P. Camner. 2001. Functional and morphological differences between human alveolar and interstitial macrophages. Exp. Mol. Pathol. 70: 77-82. Portiansky, E. L., M. C. Castellano. 1989. Normal phagocytic capacity of macrophages isolated from different canine organs. Anat. Histol. Embryol. 18: 199-204. Shibata, Y., W. J. Metzger, Q. N. Myrvik. 1997. Chitin particle-induced cell-mediated immunity is inhibited by soluble mannan: mannose receptor-mediated phagocytosis initiates IL-12 production. J. Immunol. 159: 2462-2467. Pietrella, D., C. Corbucci, S. Perito, G. Bistoni, A. Vecchiarelli. 2005. Mannoproteins from Cryptococcus neoformans promote dendritic cell maturation and activation. Infect. Immun. 73: 820-827. Chieppa, M., G. Bianchi, A. Doni, A. Del Prete, M. Sironi, G. Laskarin, P. Monti, L. Piemonti, A. Biondi, A. Mantovani, et al 2003. Cross-linking of the mannose receptor on monocyte-derived dendritic cells activates an anti-inflammatory immunosuppressive program. J. Immunol. 171: 4552-4560. Rughetti, A., I. Pellicciotta, M. Biffoni, M. Backstrom, T. Link, E. P. Bennet, H. Clausen, T. Noll, G. C. Hansson, J. M. Burchell, et al 2005. Recombinant tumor-associated MUC1 glycoprotein impairs the differentiation and function of dendritic cells. J. Immunol. 174: 7764-7772. Takahara, K., Y. Yashima, Y. Omatsu, H. Yoshida, Y. Kimura, Y. S. Kang, R. M. Steinman, C. G. Park, K. Inaba. 2004. Functional comparison of the mouse DC-SIGN, SIGNR1, SIGNR3 and Langerin, C-type lectins. Int. Immunol. 16: 819-829. Jordens, R., A. Thompson, R. Amons, F. Koning. 1999. Human dendritic cells shed a functional, soluble form of the mannose receptor. Int. Immunol. 11: 1775-1780. Leteux, C., W. Chai, R. W. Loveless, C.-T. Yuen, L. Uhlin-Hansen, Y. Combarnous, M. Jankovic, S. C. Maric, Z. Misulovin, M. C. Nussenzweig, T. Feizi. 2000. The cysteine-rich domain of the macrophage mannose receptor is a multispecific lectin that recognizes chondroitin sulfates A and B and sulfated oligosaccharides of blood group Lewisa and Lewisx types in addition to the sulfated N-glycans of lutropin. J. Exp. Med. 191: 1117-1126. Boes, M., J. Cerny, R. Massol, M. Op den Brouw, T. Kirchhausen, J. Chen, H. L. Ploegh. 2002. T-cell engagement of dendritic cells rapidly rearranges MHC class II transport. Nature 418: 983-988. Chow, A., D. Toomre, W. Garrett, I. Mellman. 2002. Dendritic cell maturation triggers retrograde MHC class II transport from lysosomes to the plasma membrane. Nature 418: 988-994. Latz, E., A. Schoenemeyer, A. Visintin, K. A. Fitzgerald, B. G. Monks, C. F. Knetter, E. Lien, N. J. Nilsen, T. Espevik, D. T. Golenbock. 2004. TLR9 signals after translocating from the ER to CpG DNA in the lysosome. Nat. Immunol. 5: 190-198.